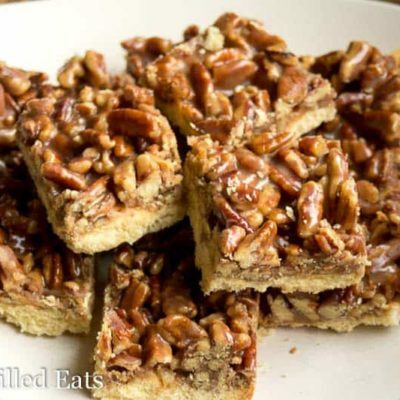 Pecan Praline Cookie Bars. Buttery crust topped with sweet, candied pecans. Perfection. 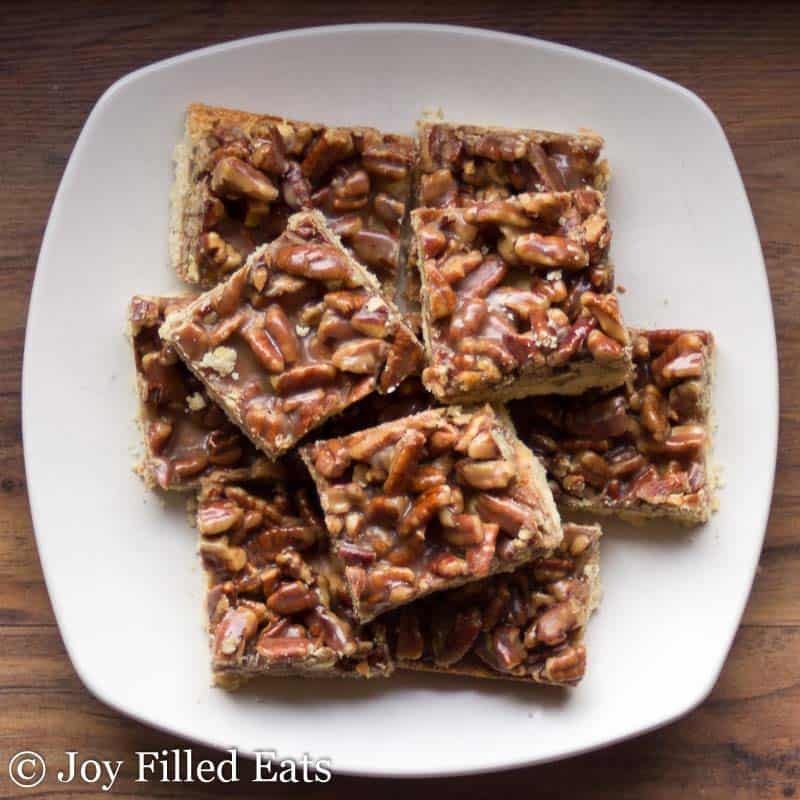 These Pecan Praline Cookie Bars are great to add to your holiday cookie tray. Or just to eat… any other day of the year. We spent the last ten days in Minnesota visiting my husband’s brother, his wife, and their 4 children for Thanksgiving. Since we flew from NJ to MN I mailed a box of necessities (my sweetener, almond flour, coconut flour, and a few other things) ahead of time. I wasn’t planning on making a ton of new recipes while we were visiting but I knew I’d want some sweets while we were there. 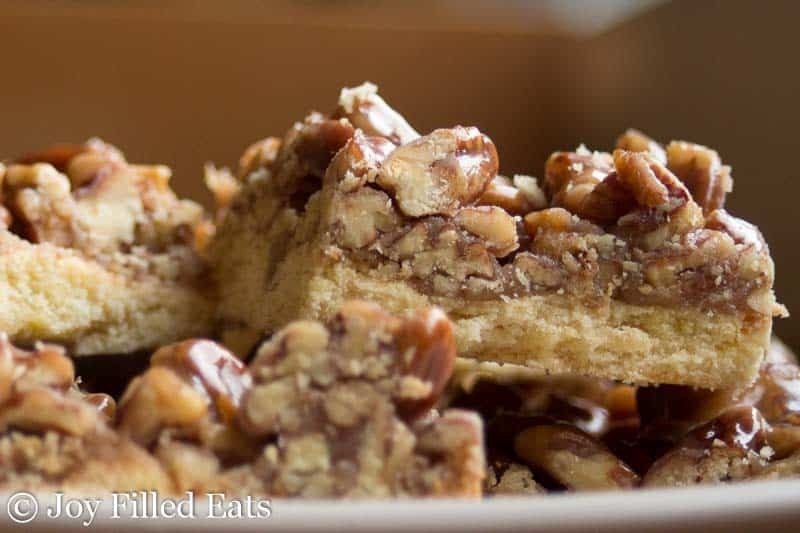 I settled on making my Creamy Pecan Praline recipe into cookie bars. I knew that I’d be happy having a couple squares of this instead of traditional pumpkin and apple pie. These filled my Thanksgiving sweet tooth and I’m planning on making another batch for Christmas. I may drizzle a little chocolate on top of them next time. There is always room for chocolate. One of the best parts of the trip was getting through security on our way home with a baggie of my sweetener in a carry-on. That bought my husband a pat down and a thorough search of our luggage. The security man thought we were pretty funny. Mom, Dad, and 4 kids armed with baking ingredients needing to be searched. I guess I should’ve just mailed a box back home too! 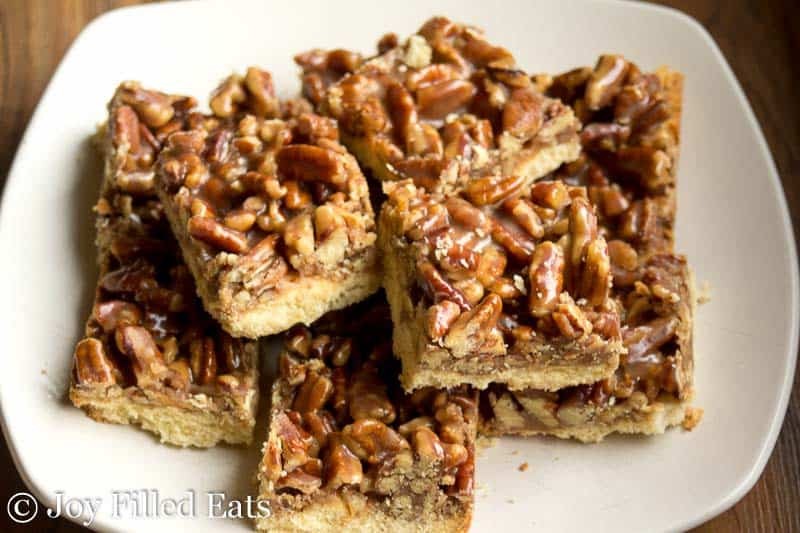 Pecan Praline Cookie Bars. Buttery crust topped with sweet, candied pecans. Perfection. These are great to add to your holiday cookie tray. Or just to eat... any other day of the year. Low Carb, Keto, Gluten Free, THM S.
Combine crust ingredients in a food processor and pulse until a uniform dough forms. Press into the bottom of a 9 x 9 inch baking dish lined with parchment paper. Bake for 15-20 minutes until golden brown. Combine 5 tablespoons butter, sweetener, and cream over medium heat. Stir until the sweetener is dissolved. Cook until it is a deep golden brown. As soon as it reached that deep color (right before burning) remove from the heat and immediately add the other 1 tablespoon butter. Stir until smooth. Add the vanilla and toasted pecans. Cool for 10 minutes. Pour on top of the prepared crust. Refrigerate until firm. This crust is a little crumbly when warm but sets up nicely when you chill it. I recommend cutting the bars, then chilling them, and then removing from the pan. My sister-in-law just shared one of these with me and I am in love with them..... I am just starting with THM and have so much to learn but for sure these are going to be one of my first baking treats made.....I just copied down the recipe and noticed that it does not show the serving amount....I am guessing that it would be just one bar but wanted to check.....would never have believed that healthy eating could taste so amazing....thanks for all you do here to help those of us who love to eat good tasting foods but are not creative so we rely on the kind hearts of others willing to share their love of cooking. Have book marked your site and expect to return here often. Once again just want to say THANK YOU! Yes, nutrition facts are for one bar. The BEST Keto/THM dessert recipe I've tried so far! This is definitely a keeper! I shared my cookie bars with a neighbor, and she thought she'd died and gone to heaven. I will definitely be making these again very soon! Oh my, these are wonderful. the best low carb, keto treat that I have ever had and I have tried many over the past year. They are absolutely delicious. 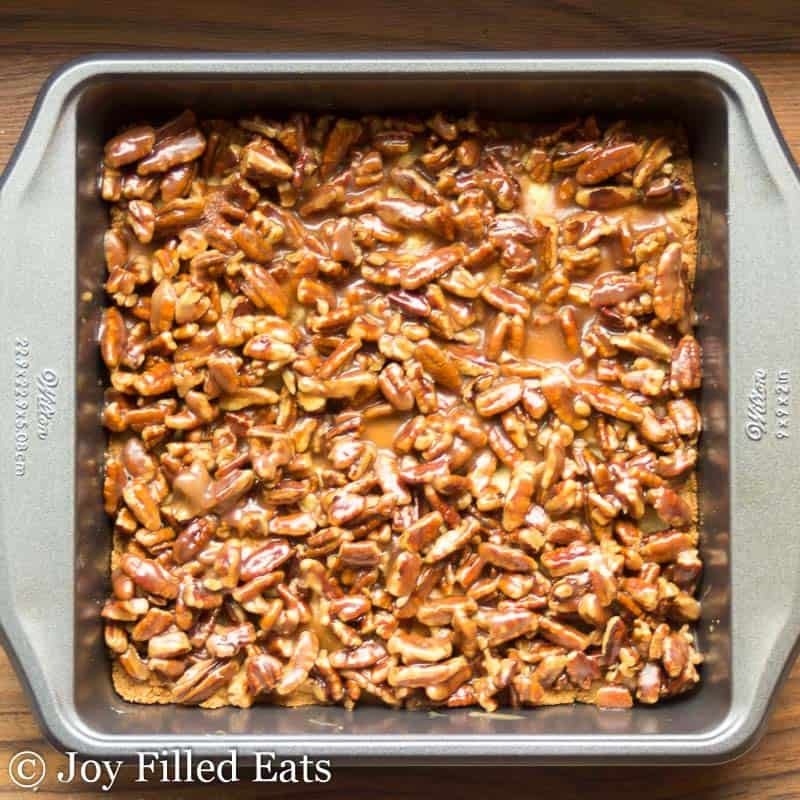 I have made them several times and today I used peanuts instead of pecans and they too are awesome! Great recipe thank you! I have made this several times, always tastes great. Did double up once didn't work out so well, but still yummy. A few of the times I've made it I've crumbled "failed" cakes as the base. Just mixed enough melted butter to dampen cake then press into pan and chill ready for topping. The cakes were chocolate , adding another dimension...Great! I just need to add that...while I'm certain this will taste amazing, my cooked mixture never turned a "deep golden brown"...and I kept waiting for that...thinking I should take it off the heat. I should have. It SEPARATED! It was so gorgeous right up until then. I'll know better next time...but dang!! It's gonna be soupy lol. Don't worry. It will still be fine for this recipe :) 'deep golden brown' is kind of a relative term but it was the way I had to describe it. Smelling caramel-y and coating the back of a spoon are other things to look for. I have read in other recipes that if you grind it to powder it won't crystallize after it cools. Worth a try. Made these for Thanksgiving, they were excellent! Definitely going to make them again sometime soon and they will be a great treat for Christmas as well! My brother in law's who are also sugar-free devoured them and asked if there are any more 😂 One of them couldn't believe it was sugar free! I made these last night for my husband (following recipe exactly as is). He absolutely LOVED them. I will definitely be making them again. Living outside Toronto. Have not heard of the sweetener you use, but I use monk fruit sugar. It dissolves quite well when in warm mixture. Do you think I could use? Would you have an idea of where to purchase your sweetener? Could I sub thm baking blend for the Almond & coconut flour? If so, same measurements but all in baking blend? Thanks! They look so yummy! Yes, but only use about 2/3 of the amount or the crust will be dry. These are excellent - have made them several times & get RAVE reviews. I plan to make these again later today but I am running low on Gentle Sweet... Would Super Sweet work if I did the conversion? I'm not sure. They might need the bulk of gentle sweet. Do you have xylitol or erythritol? You could do half SS and half one of those. I made this with Pyure and I think I shouldn't have let the mixture cool for 10 min. The sauce turned out great and even browned! I've never made that before, so was very excited. I wasn't able to poor the mixture on, I had to spread on the shortbread. Once chilled the shortbread was pretty crumbly. It still tastes great. It was for my husband's birthday and was a great replacement for sugary pecan pie! Hi KB, did you use 1/2 cup of Pyure ? Every time I find a recipe it seems I always need an ingredient that I don't have. I do have Pyure and don't want to have to buy Trim Healthy Mama Gentle Sweet or the ingredients to make Taryn's blend. Thank you. I have made these 2 times in 2 days. A slight chocolate drizzle makes them even better. Thank you! Were do you get the sweetener or can you use some like stevia? You can buy Trim Healthy Mama Gentle Sweet on their website or on Amazon. My sweetener and links to the ingredients are at: http://www.joyfilledeats.com/sweetener I don't think plain stevia would work in this recipe. Could I use coconut milk (full fat) instead of heavy cream in this recipe? I have made these bars 3 times in the last 6 weeks....they came out perfectly each time and are so delicious. Thank you so much for sharing this recipe! Just made these but the topping didn't stick to the crust... so when I cut a square it turns into a crumbly mess. I think I went wrong letting it cool 10 minutes before pouring on top. Any ideas for salvaging the recipe before I serve it tomorrow? If you pop it in the oven for a few minutes the topping might melt enough to adhere to the crust. Or you could put melted chocolate on top like glue. It is important to cut this before it cools too much. Or you could put it in clear plastic cups crumbled and put a dollop of whipped cream on top. Hi Hannah, I'm not sure why that would've happened. I've made this crust at least a dozen times and I've had many readers make it successfully too. Sorry to ask such a silly question but are you sure you measured the coconut flour correctly? This only uses one and a half teaspoons. If that is off it can ruin the whole recipe. This looks amazing! I'd like to make these for Christmas but am wondering if I can use Swerve or just Stevia in place of the gentle sweet or your blend? Thanks! Sorry, but I'm not sure. I doubt stevia would work and I'm not familiar with how well swerve melts. What did I do wrong here? My sweetener/butter/cream mixture never browned, it just separated until it was mostly butter, as if the dm cream and 'sugar' melted off. I tried it three times and followed the directions exactly. Help! Hi Audra, are you using gentle sweet? Omygoodness... these are wonderful! I made them to take to a Christmas party last night and they disappeared. I have already been commissioned (by my husband) to make them again for another party on Wednesday/ It's a keeper-- thank you! This is probably the best low carb recipe I have made so far. I tried this recipe last week and took it to a potluck. There were two small pieces left and the hostess kept them when she packed up my plate to go home. Many of my friends are pre-diabetic (as am I) and so really appreciated knowing that they could eat this and not feel guilty! I have since made it again for just my husband and myself and have loved it as much as my friends. It is so easy and tastes so good and it will have a permanent place on my cookie tray. Thanks for always great recipes and I do appreciate the nutrition info with the recipes! It would also make a great praline without the crust!